As fracking has become the most significant environmental law and public policy question of the 21st Century, its impact has spread out to touch numerous disciplines and many areas of law. Fracking: Law and Policy is the single-source reference that addresses all the law and public policy issues relating to fracking. 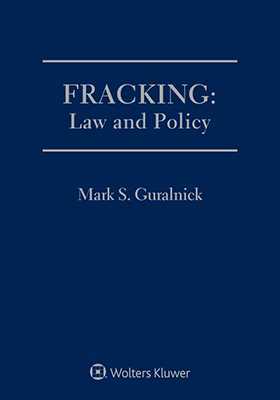 Written by, Mark S. Guralnick, this multi-purpose deskbook addresses the current law and public policy issues related to fracking. It also serves as a formbook, practice manual, and reference guide covering all key areas of fracking, including the law, environmental, business, and public policy arenas. Jurisdiction, regulation, litigation, mineral rights and royalties, banking and insurance issues, worker safety and injury claims, insurance coverage, environmental and public health controversies, activism, and more, are all covered. A practical outline of the steps involved in taking a fracking case to trial, including a discussion of motions, evidence questions, and various kinds of damages and remedies. Fracking: Law and Policy takes an objective look at organized activism, the need for engagement, and the risks associated with extremism and misinformation. A list of activist groups is provided. Fracking: Law and Policy provides the most comprehensive and meticulous examination of all scientific, regulatory, economic, cultural, social, legal, and policy issues connected to this highly charged topic. It is the ideal resource for lawyers, regulators, scientists, engineers and oil and gas contractors, insurers, investors, safety inspectors, citizen advocates, legislators, policymakers, energy professionals and financial advisors. § 1.01 What Is Fracking? § 1.02 What Is Shale? § 1.03 How Did Fracking Begin? § 1.04 How Are Shale Formations Found? § 1.05 Where Are the Shale Formations? § 1.06 What Is the Controversy? § 1.07 Who Are the Stakeholders? § 10.02 What Information Is Useful?